This museum is considered as one of the largest and the main museums in the country. It was founded in 1921, when Yerevan was greatly developing. Its has collected more than 400 thousand exhibits during the time of existence. The exposition of the museum presents the whole history of Armenia from the era of primitive society to present day. It displays a variety of jewelry, coins, household items, tools, weapons, carpets and clothing. All the findings were made during the numerous archaeological expeditions. Moreover, due to new archaeological discoveries, the History Museum of Armenia regularly updates its expositions and holds theme exhibitions. It is worth to mention that the museum keeps quite rare and interesting exhibits. For example, recently the collection of museum was enlarged with shoe, which is 5500 years old that makes it the oldest shoe in the world. 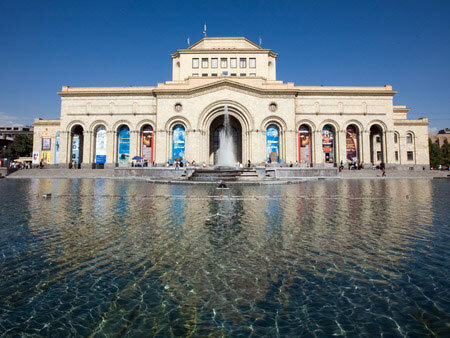 The History Museum of Armenia has the large library, which keeps more than 50,000 books dedicated to history and representing historical value. One of such publication is the first Armenian printed book “Urbatagirk” (Friday Book), which was published in 1512 in Venice. The State History Museum of Armenia is not just the museum, but the real time machine, which is able to carry you to the era of the ancient state of Urartu, to the era of constant struggle against the Ottoman and Persian empires, etc. The exposition of the museum allows watching all objects from any angle. Staying in Yerevan do not miss your chance to visit this museum.